Gray Hairstreak is actually a scrub-hairstreak, in a quite different genus from the Callophyrs hairstreaks. It was first named by Hübner in Germany from a southern U.S. specimen, but Thaddeus W. Harris at Harvard also distinguished it as a separate species on the basis of his Milton, Massachusetts specimens. Harris wrote in his 1841 Report on Injurious Insects that “The heads of the common hop are frequently eaten by the little green and downy caterpillars of a very pretty butterfly, which has been mistaken for the Thecla Favonius, figured in Mr. Abbot’s “Natural History of the Insects of Georgia”; but it differs from it in so many ways that I do not hesitate to give it another name, and will therefore call it the hop-vine Thecla, Thecla Humuli (1841:215)." Pelham (2008) and others today propose two eastern subspecies of Gray Hairstreak: Harris' S. m. humuli, a northern variant with reduced orange marks on the ventral hindwing, and S. m. melinus, more prevalent in southern states, with larger orange marks. Massachusetts photos show a range of amounts of ventral hindwing orange, seeming to include both southern and northern forms (e.g. photos by B. deGraaf at http://bit.ly/NssSxa ; and on the MBC website). The Gray Hairstreak has probably been known in southern New England since at least the beginning of hops cultivation. The native hops vine was brought north for beer production in the early 1700’s; it was grown extensively in Woburn as early as 1702, for example (Russell 1982: 69). Hops cultivation provided a new New England host plant for the Question Mark and the Eastern Comma, as well as the Gray Hairstreak. In Harris' collection at the Harvard Museum of Comparative Zoology, assembled 1822-1850, there are four specimens of "Thecla humuli Harr." from Milton, dated only "June" (Index). Scudder’s account of Gray Hairstreak suggests that it was common in eastern Massachusetts by the end of the 19th century (1862; 1899: 854; Maynard 1886). It probably increased with the spread of agriculture in the early 19th century (Table 1). Scudder mentions that it had been found at high-elevation sites such as “Mt. Toby, Amherst Notch, Princeton and the top of Blue Hill....besides numerous lower and more southern localities.” There are pre-1900 specimens in the Harvard MCZ from Wollaston (Quincy), Brookline, Waltham and Needham, as well as two from Wellesley (1898, 1899) in Denton mounts. There are also upper and lower Connecticut River valley specimens: F. H. Sprague was the first to document Gray Hairstreak in Belchertown (1878), Deerfield (1885), Leverett (1878), and Montague (1885) (specimens in MCZ; see also Sprague 1879). Early twentieth century specimens exist from Wayland (1919), Weston (1925), Walpole (1930), and Wellesley (1932) in the MCZ, and from Dover (1931), Melrose (1920, 1932), Watertown (1936), and “Blue Hills” (1946, H. K. Clench) at the Yale Peabody Museum. Farquhar (1934) adds Stoneham, Malden, Marblehead, Salem and North Andover to this list. The earliest Cape Cod specimens appear to be those from Barnstable 1950 and 1953 (C. P. Kimball). There appear to be no specimens from Berkshire County before the 1980’s, but there is one from northerly Ashburnham in Worcester Co.(1965, C. G. Oliver). On Nantucket, Gray Hairstreak’s presence apparently dates from before 1900, since Jones and Kimball (1943: 33-34) report that it is in the 19th century Bolter collection at the University of Chicago. They also mention a C. W. Johnson specimen from Surfside dated August 8, 1927. For Martha’s Vineyard, Jones and Kimball say that Gray Hairstreak was “regularly present, though never abundant” in late July and August in the 1930’s and early 1940’s. One Vineyard specimen by F. M. Jones, no date, is in the Yale Peabody Museum. Gray Hairstreak is found in a variety of open, weedy and disturbed sites, both wet and dry, including meadows, gardens, beaches, and vacant lots. It is almost never found in woods, except in spring before canopy closure. In Massachusetts, hilltops, ridges, and drier locations have proven productive. Gray Hairstreak uses an extensive list of larval host plants, although mainly mallows and legumes. Common hosts in the wild in New York were reported to be rabbit-foot clover (Trifolium arvense), white clover (T. repens), bush clover (Lespedeza capitata), white sweet-clover (Melilotis alba), and Malva neglecta (Shapiro 1974). During the 1995-99 Connecticut Atlas project, eggs or caterpillars were found in the wild on tick-trefoil (Desmodium spp. ), alfalfa (Medicago sativa), bush clovers (Lespedeza spp. ), and clovers (Trifolium spp.). Many of these commonly-used plants, including most Malva spp., are non-natives which have become naturalized, and to which Gray Hairstreak has adapted. Gray Hairstreak is therefore among the adaptable “Switchers” shown in Table 3, having very early adopted some imported European plants as hosts. A century ago Scudder reported that Mr. A. C. Sprague found the larvae in central Massachusetts on Cynoglossum officinale, and that they were also found on ‘common garden beans” (1899: 854). Neither of these plants is native. Cynoglossum or Hounds Tongue is an introduced species, naturalized from Europe over most of Massachusetts except the southeast coastal plain (McGee and Ahles 1999; Dow Cullina et al., 2011). In southern states, Gray Hairstreak is an occasional agricultural pest on hops, beans, and cotton, the larvae being called Cotton Square Borer in Texas (Scott, 1986). 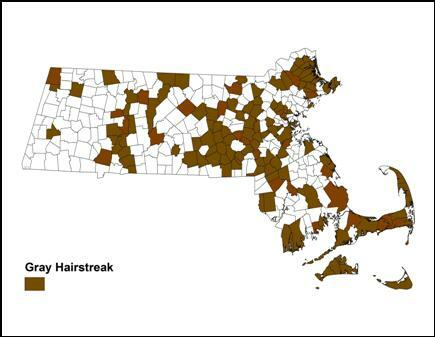 As noted, 18th-century hops cultivation in Massachusetts provided a new New England host plant for the Gray Hairstreak, and may have facilitated its spread north into the state. Hops is a vine native to the southern United States, but it was brought north for use in beer production (see Question Mark). A wide variety of plants and plant families can function as larval hosts for Gray Hairstreak (Scott 1986), and different species are used in different parts of the butterfly’s wide continental range. More information is needed as to what hosts are most used today in Massachusetts. MBC reports 2000-2007 rank Gray Hairstreak as Uncommon relative to other species in the state (Table 5). (Note that the 1999 outbreak is not reflected in this ranking.) The 1986-90 MAS Atlas had termed it “uncommon to common,” and this may be a more apt description, since there apparently can be outbreak or influx years. As Chart 33 shows, in 1999 there were unusual numbers seen in the state, with double digits reported on the Foxboro, Northern Worcester, Central Franklin, Falmouth and Martha’s Vineyard NABA Counts, all in July. That year also produced some of the earliest, and certainly the latest (Nov. 1) sightings on record. Numbers on these NABA Counts were back to the normal single-digits in 2000 and after, however, so that 1999 seems to have been a one-year influx or outbreak. Gray Hairstreak is not as well known for major northward migrations as the Painted Lady or the Common Buckeye, but in 1969 this species migrated north into New York state in considerable numbers (LSSS 1969), and the Connecticut Atlas notes that “additional populations are established in some years by immigrants from the south” (O’Donnell et al., 2007). Chart 33 suggests some tendency toward decline in sightings over the 1992-2009 years, even if the 1999 influx is excluded. Supporting this, a study using list-length as a measure of effort with these data found a statistically significant 59.2% decline in Gray Hairstreak 1992-2010 (Breed et al. 2012). However, there is no obvious reason this widespread multiphageous species should be declining, and subsequent years show increases. In 2010 season summary statistics showed that the average number of Gray Hairstreaks seen on a trip was up 13%, and the number of reports up 38%, compared to the preceding 1994-2009 average. In the previous three years these statistics had seen declines (Nielsen, Massachusetts Butterflies 2011). Although no precise statistics are yet available, 2011, 2012 and 2013 also showed very high numbers of Gray Hairstreaks in the state. Gray Hairstreak was found in 133 out of 351 towns 1991 through 2013. During the 1986-90 Atlas period, Gray Hairstreak was “widely reported in eastern Massachusetts, sparingly in western Massachusetts.” MBC 1991-2009 records show the same regional disparity (Map 33). Although this species could turn up anywhere in the state, it has been much more common in the eastern half of the state than in the west. This species has been reported only three times on the North Berkshire NABA Count, in numbers of 1-2. It has never been reported from long-running Central Berkshire and Southern Berkshire NABA Counts. By contrast, it is usually found on the Central Franklin County NABA Count, with a high of 16 on 7/10/1999, and almost always found in good numbers on the Martha’s Vineyard NABA Count, with a high of 36 on 7/17/2011. It is found throughout Cape Cod, with good numbers usually on the Falmouth NABA Count. Gray Hairstreak is “uncommon-to-common” today on Martha’s Vineyard (Pelikan 2002), and MBC has many records. The latest recorded sightings often come from Martha’s Vineyard (e.g. 11/1/1999; see below). MBC also has one Nantucket record (8/20/2003, B. Cassie), and local observers rate it as a likely find, especially given the historical records (see above) (LoPresti 2011). Gray Hairstreaks have been found as singles on several islands: Nahant (7/21/2010, J. LeBlanc, confirmatory photo); Naushon Island (7/26/1993, D. Lang); and Penikese Island (7/3/1986, T. French). Gray Hairstreak is usually found singly or in small numbers at any given locality. Reliable locations with higher numbers reported include Canton Great Blue Hill (5 on 7/3/2011, E. Nielsen); Dartmouth Allens Pond and Gooseberry Neck; Edgartown and West Tisbury Correllus SF (12 on 4/17/2012, M. Pelikan) ; Falmouth Crane WMA (11 on 8/4/2013, J. Dwelly); Foxboro Lamson Road; Mattapoisett Nasketucket SR (7 on 8/24/2013, J. Dwelly); Medford Middlesex Fells (10 on 4/21/2012, M. Arey); North Andover Weir Hill TTOR; Stow Delaney WMA (10 on 5/21/2011, M. Arey); Upton Chestnut St. gas line; Wellfleet Wellfleet Bay WS (8 on 7/10/2013, M. Faherty); Woburn Horn Pond Mtn. (8 on 8/26/2006, M. Rines et al.). Gray Hairstreak probably has three broods in Massachusetts, although the 1986-90 MAS Atlas mentioned only two. Three broods are suggested by the MBC flight chart http://www.naba.org/chapters/nabambc/flight-dates-chart.asp , which shows sighting bulges in April-May, July, and late August-early September, although some of the later sightings may be southern immigrants. 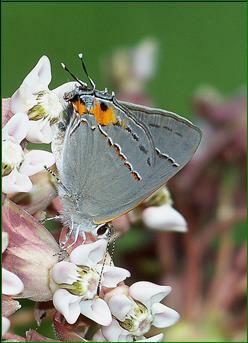 In Connecticut, the 1995-99 Atlas found Gray Hairstreak “multiple brooded” in that state, and capture data likewise show three clusters (O’Donnell et al., 2007). Thirty years ago in New York, Shapiro (1974) reported multiple (3-4) broods on Staten Island, but only one at the latitude of Ithaca. Three or more broods are common in southern states, two further north (Cech 2005). Earliest sightings: In the 23 years 1991-2013, the six earliest “first sighting” dates in MBC records are 3/23/2012 Woburn Horn Pond Mtn. M. Arey; 3/29/2002 Hingham Turkey Hill TTOR D. Peacock; 4/8/2010 North Andover Weir Hill TTOR H. Hoople and R. Hopping; 4/18/1999 West Tisbury SF, M. Pelikan; 4/19/2004 Edgartown SF, M. Pelikan; and 4/20/2006, Foxboro, M. Champagne. The MAS Atlas early date had been 4/12/1977, Woburn, R. Robbins. Latest sightings: In the 23 years 1991-2013, the six latest “last sightings” of Gray Hairstreak in MBC records are 11/1/1999 Edgartown Katama Plains, M. Pelikan; 10/26/2010, Beverly, K. Haley; 10/24/1994, Wellesley, R. Forster (also cited in the MAS Atlas); 10/22/2007 Dartmouth Allens Pond, M. Champagne; 10/21/2000, Rockport, Waring Field, F. Goodwin; and 10/20/2011 Dartmouth Allens Pond, M. Champagne. Flight time advancement: It seems likely that this species is advancing its spring flight time in Massachusetts. Scudder wrote 100 years ago, referring to southern New England, that Gray Hairstreak “first appears in the early days of May...” (1899: 854). Today Gray Hairstreak is already becoming common by the first week in May (see flight chart), and the earliest sightings are fully a month before that, in April. As to late flight dates, Scudder wrote a century ago that Gray Hairstreak flew “through August and occasionally even until the middle of September. Mr. F. H. Sprague has even taken one October 10 at Wollaston, Mass” (1899: 854-5; Sprague specimen in MCZ). Sightings through the third week in September are now common (see flight chart), suggesting a longer flight period compared to the 19th century. Sprague’s capture on October 10 would rank as late today, but would not set a record. This species is mobile, and has adapted to use a variety of larval host plants, both native and non-native. It is probably quite able to colonise new habitats. Cech (2005) terms it a “generalist” species. Given its southern range, it should not be adversely affected by climate warming in this state. Gray Hairstreak’s Massachusetts conservation ranking is S5, or “reasonably secure” (NatureServe 2012).